Happy New Year! Once again it’s January and between all that eating and drinking we all indulged in during the celebrating with all our loved ones over the holidays and after being bombarded with all the weight loss programs and fitness centers advertisements, many start thinking about making a New Year’s resolution to lose weight. Yet, some of the most firmly held beliefs about weight loss concepts promoted in the popular media are unproven or downright untrue. Small changes in food intake and/or exercise will produce large, long term weight changes. This idea is based on that thirty-five hundred kilocalories equals a pound of weight, however it does not take into account that, as weight is lost it takes increasingly more exercise and reduced intake to continue the loss. Realistic weight-loss goals will keep people motivated. This idea seems reasonable, but it is not supported by evidence. In fact, several studies have shown that people with very ambitious goals lose more weight (example: TV’s The Biggest Loser). As in, “Shoot for the moon. Even if you miss, you’ll land among the stars”~Les Brown. Slow, gradual weight loss is best for long-term success. Published research of randomized, controlled weight-loss trials found that, rapid weight loss from a very-low-calorie diets resulted in significantly more weight loss at 6 months and differences in weight loss lasted up to 18 months. (Int J Behav Med. 2010;17:161-167). Eating breakfast prevents obesity. All though not recommended, published studies have shown no effect of eating versus skipping breakfast. Adding fruits and vegetables to the diet results in weight loss. Eating fruits and vegetables is definitely healthy, however, adding more calories of any type without making any other changes is likely to cause weight gain. Moderate environmental changes can promote as much weight loss as potentially dangerous weight-loss drugs and/or surgery. Diets that reduce the total amount of calories produce weight loss, but attempting to diet and telling someone to diet are not necessarily the same thing. 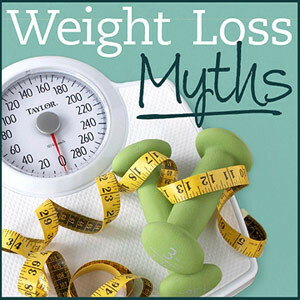 I hope this post sheds some light about the myths versus facts about obesity and weight loss, and if you have any additional information about this topic or have any additional questions, please feel free to comment below.